My transition from full-time farmer to full-time outdoor writer has been a gradual one. 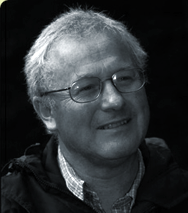 In 1973, with the direct encouragement of Alfred Wainwright with whom I regularly spent weekends, I wrote my first walking guide to the Cotswold Way. Since then I have indulged a pleasure in exploring rural Britain by creating a range of walking guides. 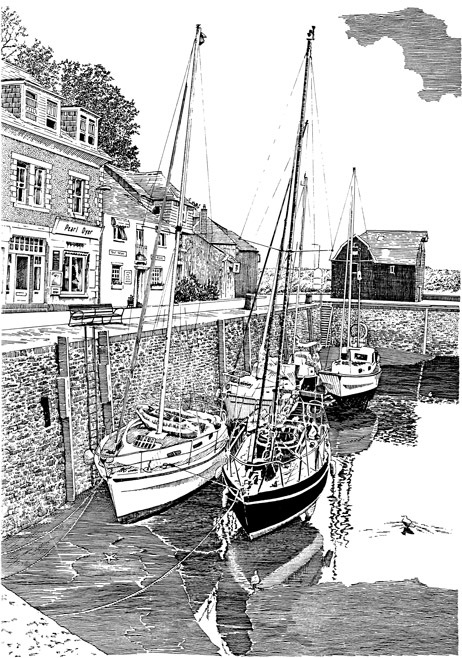 My love of pen and ink drawing is an important key to the later interest in creating walking guides. 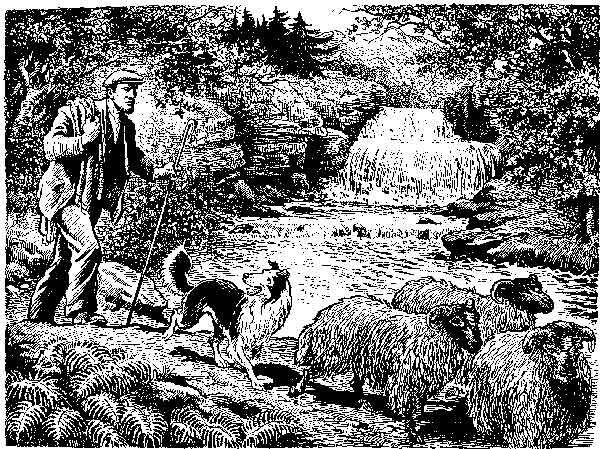 The cartoon stories of 'Black Bob The Dandy Wonder Dog' were my primary influence, these exciting tales of an intelligent sheepdog and his master Glen, based around Selkirk in the Scottish Borders, captivated my youthful imagination (see below). 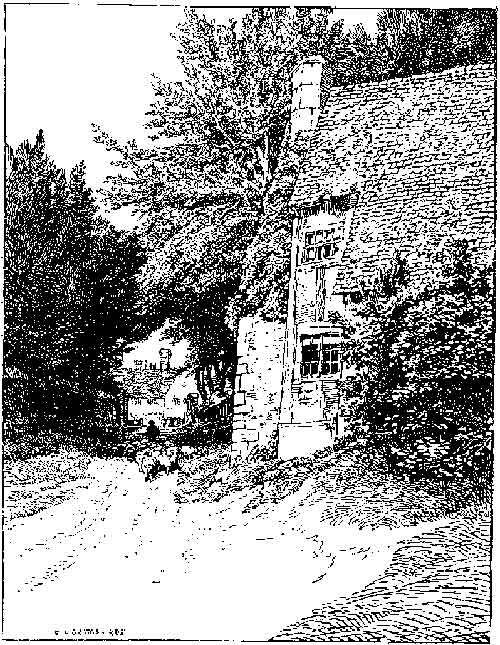 Also the delightful penmanship of Frederick Griggs from Chipping Campden, who illustrated many of Batsford's Highways and Byways series of books (like the drawing featured below). Then, aged 13 on a day trip to the Lakes from my uncle's farm in Leck, I acquired Wainwright's Southern Fells - my secondary, and perhaps greater influence. Later, during my early twenties, having already been deeply involved in Young Farmers in my teenage years, I discovered the fun of exploring new countryside on foot. Gloucestershire Mountaineering Club nurtured my first mountain steps and appreciation of the wild Welsh, Scottish and English landscapes. 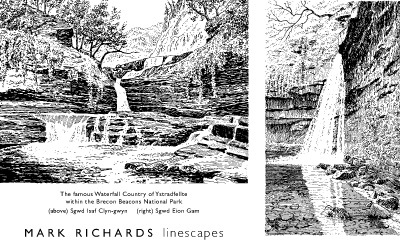 I opened AW's Southern Fells again and delighted in his prose and artistry, the idea of prolonging my weekends hillwalking pleasure by creating line drawings from my black and white photographs proved an attractive pastime - and a welcome escape from an isolated farm existance as well as something to do on long winter evenings. A friendship with Alfred Wainwright led me to create my own walking guides, in his master's footsteps, adapting AW's handscribing style. Progressively the graphic work was balanced with easy-to-follow directions supplimented by a carefully observed and researched commentary. Over the years my hand graphics have been incorporated into computer page design, enabling me to create complete books to meet the demands of digital printing. Under the watchful eye of AW my first guide to the Cotswold Way was published in 1973; he re-wrote the introduction for good measure! Wainwright told me that ..'even a duffer can make good if he tries hard enough...' I interpreted this as encouragement! As a full-time farmer living in the Cotwolds my guidebook production line was more than steady, it was a hobby after all. My early, regular trips up to Kendal Green for long weekends with AW and Betty largely came to an end after my marriage, but that unique tutorage has served me well over what is now thirty-five years of happy wandering and creative outdoor writing and illustration. There followed further hand-written guides to Walking the North Cornwall Coastal Footpath, Through Welsh Border Country following Offa's Dyke Path - long titles my trademark at that time. Then Cicerone Press beckoned me north to explore the Peak District National Park and three guides ensued, High Peak Walks, White Peak Walks, Northern Dales and Southern Dales. From teenage years I was drawn to the fells of Cumbria and the high Pennine Dales, though my family roots were divided between Oxfordshire, Gloucestershire, Cornwall and the fell country of Wensleydale. I attempted creating a long walk of my own in the spirit of AW's Coast to Coast Walk. With the admiral assistance of Christopher Wright, I prepared a guide to a Westmorland Heritage Walk orbiting the old county, it was great fun to do, but failed to sell out even the first print-run. Living comparatively close to Wales I enjoyed many commissions writing practical walk guides for Powys and Gwent County Councils including the Wye Valley Walk, Glyndwr's Way, Usk Valley Walk and numerous circular walks guides, including the creation of a short linear path in the Berwyn Mountains, the Pererindod Melangell Walk adopted and signed by the local community. My magazine output has always been sparing. The happiest adventures in this field were for Climber & Rambler and The Countryman, but from time to time sundry articles and artwork have appeared in such journals as TGO and Country Walking. Perhaps my most interesting was editing Walking Wales through its inception year. Hadrian's Wall entered my life in the early 1990s and might be thought the trigger for the next big move: the lure of the North could not be resisted so, with my wife Helen, I moved to glorious Geltsdale at the edge of the Eden Vale. Here I embarked upon Lakeland Fellranger with Collins, an eight-volume guide to every fell in the National Park. Cicerone Press has now taken charge of this important series: re-born in October 2008 currently in print are The Central Fells and The Near Eastern Fells, with The Mid-Western Fells and The Southern Fells arriving in late February 2009. My recent work includes leaflets to the Stagecoach bus services in Lakeland under the title From A to B to SEE, a new guide for Cicerone Press to the Hadrian's Wall Path, plus The Roman Ring, an expansive exploration of Wall Country, in association with Shepherd's Walks (visit: theromanring.com). The greater pleasure of living in Cumbria brought another creative development the idea of a regular walking feature on local radio, from which begun Park & Stride on BBC Radio Cumbria's Ian Timms Show, now the Liz Rhodes Show. In 2007 I researched a special big book describing fifty classic circular fell walks published Spring 2008 'Great Mountain Days in the Lake District', the remainder of the year has been devoted to revisiting the Derbyshire Dales/Staffordshire Moorlands in creating a new generation of the double volume Northern and Southern guide of White Peak Walks for Cicerone Press. Following my brief appearance during the Helm Crag episode of Julia Bradbury's 'Wainwright Walks' series in early Spring 2007, I had a second encounter on the last day of Skyworks six-part series focusing upon AW's Coast to Coast Walk broadcast in 2009 on BBC2. This year 2010 I had the pleasure of Julia's company for a third time. This occasion we were down in the Cotswolds, meeting up in late April to talk about the Cotswold Way for BBC1's Countryfile programme - celebrating the fortieth anniversary of this scarp edge trail's launch in 1970 and for which I prepared the very first guidebook. Since then I have been embarking on my own filming ventures, the intention to present a grand parade of walking landscapes in harmony with ChromaVision Media. 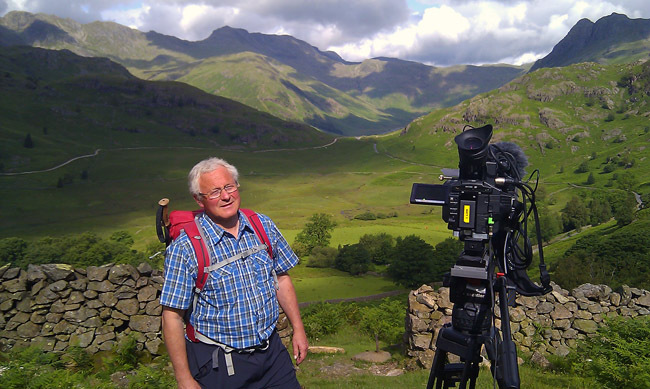 This began last year with The Dales Way, a 60-minute DVD released October 2010, part of a 'Great North Country Walks' series filmed and edited by Steve Lord of Halifax . The latest manifestation is currently reaching its latter filming stages. The Westmorland High Way being a three-day journey from Westmorland Motorway Services on the M6 to the westernmost point in the old county, namely the summit of Bowfell. Thrilling walking and huge fun to create!